The most famous constructions in Egypt are the pyramids, burial monuments with the well-known triangular shape. The pyramid developed from the early mastaba tombs. The oldest pyramid is that of King Djoser (3rd Dynasty) at Saqqara. His architect, Imhotep, decided to build a number of mastabas, one on top of the other, thus creating a step pyramid with six steps. Although later pyramids have a step-shaped core, the majority have smooth outsides, created by filling the space between the steps with rubble or smaller stones. The earliest pyramids with smooth sides are those of Seneferu (4th Dynasty) in Dahshour. Djoser's tomb clearly shows that the pyramid was only a part of a much larger complex. In addition to the burial monument itself there was a temple for the mortuary cult, built next to the pyramid, and a valley temple in the Nile valley connected to the pyramid by means of a processional way. In addition, many pyramids also have several subsidiary pyramids, the tombs of family members. The entire complex was enclosed by a wall. Stone for the construction was usually mined nearby, but parts were also executed in granite that had to be brought from Aswan. The outside layer was usually constructed of blocks of limestone from Tura. The most famous pyramids are those of Giza, built by Khufu, Khephren and Menkaure. During construction, certain astronomical principles were followed, and as a result the pyramids themselves are aligned with the four cardinal points and their shafts with certain constellations, for example Orion. Recent research with a small robot has revealed a door in one of the shafts leading to much speculation about as yet undetected chambers. At the end of the 5th Dynasty (Unas) and during the 6th Dynasty, the kings decorated the insides of their tombs with a collection of funerary spells, the so-called Pyramid Texts. Pyramids continued to be built for a long time after the end of the Old Kingdom, but they were much smaller and usually of poorer quality. The Middle Kingdom pyramids, built in places such as Lisht, Hawwara, Lahun and Dahshour, consist of a core of crossed walls of stone, filled in with mudbrick, which made the construction much less solid. Once the outer layer of stone was removed to be reused elsewhere, the core suffered enormous damage. In the New Kingdom the kings were buried in hidden tombs in the Valley of the Kings. The pyramid shape was then used mainly for the building of the chapels in private tombs, such as in the village of Deir el-Medineh. These were usually small, mudbrick pyramids with a stone pyramidion at the top. Centuries later, the tombs in Meroë and Napata would also be built as pyramids. Opinions are divided about the symbolism of the pyramid. Although everyone agrees that the constructions were meant to rise up (literally) above the tombs of the officials and to be visible from afar, some think that the shape had a deeper meaning. It has been suggested that it represents the rays of the sun, particularly because the top was usually gilded and reflected them. It has also been linked with the 'benben' stone of Heliopolis, with the sun god, and with the primeval hill. 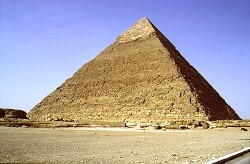 Others see the pyramid as a means of ascending to heaven, where the deceased king hoped to stay with the sun god.